Anheuser-Busch hopes that warm weather puts people in the mood for fruity light beers. The company is releasing Michelob Ultra Fruit Infused beers. 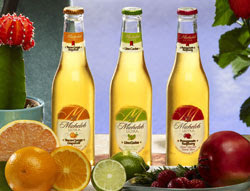 The new Michelob Ultra brews come in three flavors: Pomegranate Raspberry, Lime Cactus and Tuscan Orange Grapefruit. The 4.2 percent alcohol by volume beers are being treated as summer seasonals and will be available through Labor Day. this beer is so good! lime cactus is my personal favorite! Love it love it so far Ive only had the lime cactus. Im a michelob ultra girl and this is a good change. Still light and not bloated feeling brew. Cant handle the wine coolers and such this is perfect not to sweet and not to filling. I'm a Bud & Bud Light kinda guy. The lime-cactus is AWESOME. I'm so sad it's seasonal (like the Sam Adam's Summer Ale). I truly think I could drink it year round, of course it's 90 in FLA right now. The tangerine tasted like watered down orange soda....never again. I won't even give the raspberry a chance. Tried em all. The Tuscan orange is excellent. Would like to drink it all year round. Stores keep running out though.Also would like to buy 12 packs or cases. Do they sell it in NC? The tuscan-orange grapefruit is awesome! It has a light citrus taste that's not overpowering, and a clean, "neutral" aftertaste that does not reek of liquor. The cactus lime is good, but is very similar to Miller's Chelata, or Anheuser's Tequiza---without the clean aftertaste. I have yet to try the pomegranate-raspberry. My wife and I have been Bud Light drinkers for years. On a recent trip we discovered the Lime Cactus and drank it like water. We LOVE these beers and they are now easily our favorite. If the Michelob brand was smart they would release them into the everyday lineup rather than a seasonal beer. Yes they sell it in NC, I live in Raleigh and just bought 3 six-packs of the Lime Cactus last weeken (didn't see them in larger packs) and it's my new favorite! I have been drinking Ultras since they came out, switched to the Ultra Ambers, but the Lime Cactus is definately what I'll be drinking all summer! I've been drinking the pomegranate-raspberry.... wonderful, can't get enough! I agree, I would like to have it in 12-pack or cases. I have not tried the others but there is no need, I've found my beer, LOL! Do they sell this yet in TX? I've been hooked on the new Bud Light with lime...love to try the orange one but can't find it anywhere. Anyone know if this is sold in Utah? Can't find it anywhere. I can't say that I share everyones enthusiasm! Read my thoughts here (The Beer Diary). My name is Joy! I am watching my carbohydrates and eating healthy, but I love my beer! I just tried the Michelob ULTRA Pomegranate Raspberry. I am in LOVE!! I went to their website to request that they sell this product all year around. I would encourage others to do the same. If they get enough feed back, maybe they will keep it all year around. I have tryed all of them and the lime cactus is my fave. it is sold all year round here in AZ. I think a 12 pack would be nice.